There's a load of gluten free pizza options available (including vegan cheese) at this restaurant. In fact, all pizzas can be made gluten free except for the calzones! There are also 2-3 gluten free desserts as well. When placing your order, please mention your gluten free requirements clearly to staff so that they can activate a 'coeliac' button on the computer, allowing kitchen staff to take special care with your order. The gluten free woodfired pizzas are prepared and cooked on baking paper, with all utensils being thoroughly cleaned before use. Gluten free pizza bases are freshly made every day, and are now a whopping 30cm large! 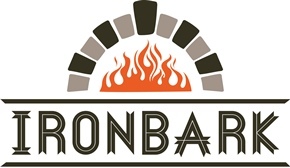 Ironbark Woodfired Pizza Restaurant & Cafe is fully licensed, and BYO bottled wine is permitted. It has tasteful Italian decor, complete with white and red checkered tablecloths. There's indoor and outdoor seating, and the outdoor area has a garden, seaside bar feel, protected in winter by cosy awnings. The restaurant is kid friendly, especially between 5pm-6.30pm when they have a great Kids Eat Free deal available. *Please note that all due care is taken when producing gluten free food, but they are produced in a kitchen where gluten is used, and may therefore contain traces of gluten.